Gruthor's pack was not only intelligent, they could speak as well. They chose a pacifistic way of life and contrary to their instructions from the Enclave, Gruthor's pack allowed humans to settle and live peacefully in the vicinity of Vault 13. 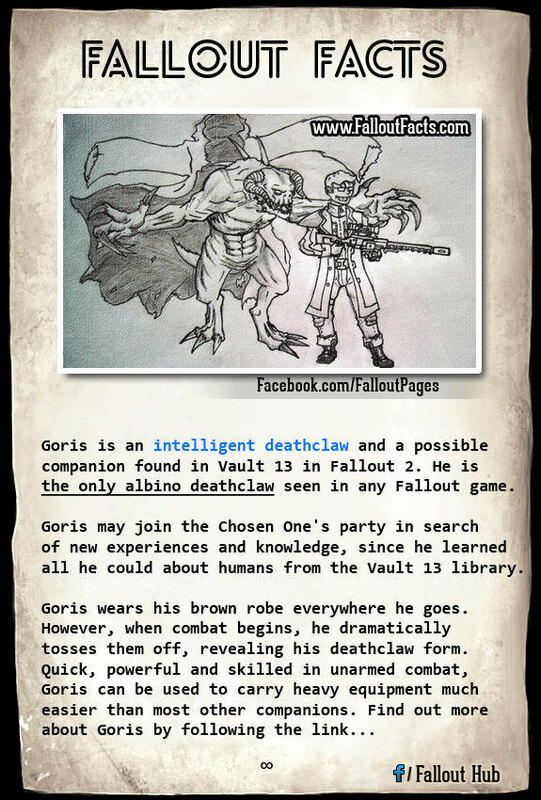 Goris spent most of his lifetime in study. He appears to be an amateur sociologist. He studied everything he could about humans in the Vault 13 library. He used his knowledge of societies and how they form to compare the development of the pack of intelligent deathclaws to the rise of various human civilizations. When the “Chosen One” arrives in Vault 13, Gruthor instructs him to visit Goris, their scholar, for information about fixing the Vault computer. After the Chosen One repairs it, Goris tells him that he has learned all he can from the Vault 13 library, and that to continue his studies he must leave the vault. He offers to travel with the Chosen One so that he will not have to travel the wastes alone. Fortunately, Goris is an albino because of an uncommon mutation from the Forced Evolutionary Virus (FEV). How could that be fortunate? Since Goris' skin is sensitive to light and the elements, he wears a robe that covers him completely. This allows Goris to safely travel into cities, towns, and other human settlements. Usually deathclaws would be shot on sight if they approached humans. 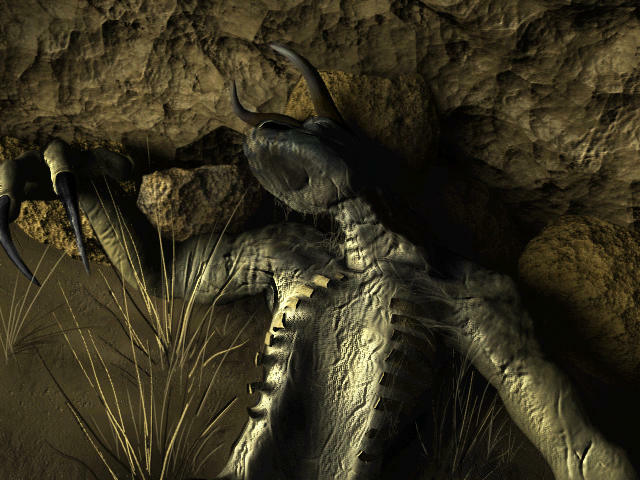 Goris is the only known Albino Deathclaw in the wastes. Goris is a powerful fighter, and the Chosen One never needs to worry about getting caught in burst fire from Goris because the only weapons he uses are his own claws. When Goris enters combat, he sheds his robe to reveal his pale grey hide, which is equivalent to Combat Armor. Another unique attribute that Goris has is his telepathic link to the rest of his pack. It is this telepathic link that alerts Goris of the massacre of his pack by Frank Horrigan of the Enclave while he is out travelling with the Chosen One. When Goris senses this, he immediately leaves the Chosen One to return to Vault 13. He arrives too late to help any of his brothers, however.